This package includes your cap, gown & tassel! Plus 1 = 4'9-5'2 over 160lbs. & 5'3-5'5 over 190lbs. Plus 2 = 5'6-5'8 over 220 lbs. & 5'9-5'11 over 250lbs. Plus 3 = 6'0-6'2 over 290lbs. & 6'3-6'5 over 310lbs. Ladies: If you are wearing heels, please include that in your height. Please select option for Basic Graduation Package. This package includes your cap, gown, tassel, 10 pack of announcements and the Taft College Stole! Please select option for Black Graduation Package. This package includes your cap, gown, tassel, 10 pack of announcements, TC Stole, and a TC Zipper Pull Medallion to wear on your gown! Please select option for Gold Graduation Package. This package includes your cap, gown, tassel, 10 pack of announcements, TC stole, TC Zipper Pull Medallion to wear on your gown, and a Hawaiian KuKui Nut Necklace! Please select option for Cougar Graduation Package. Gold satin stole trim in black and embroidered with our name and seal. Perfect gift for your graduate! This medallion zipper pull is worn on your gown during commencement ceremony. 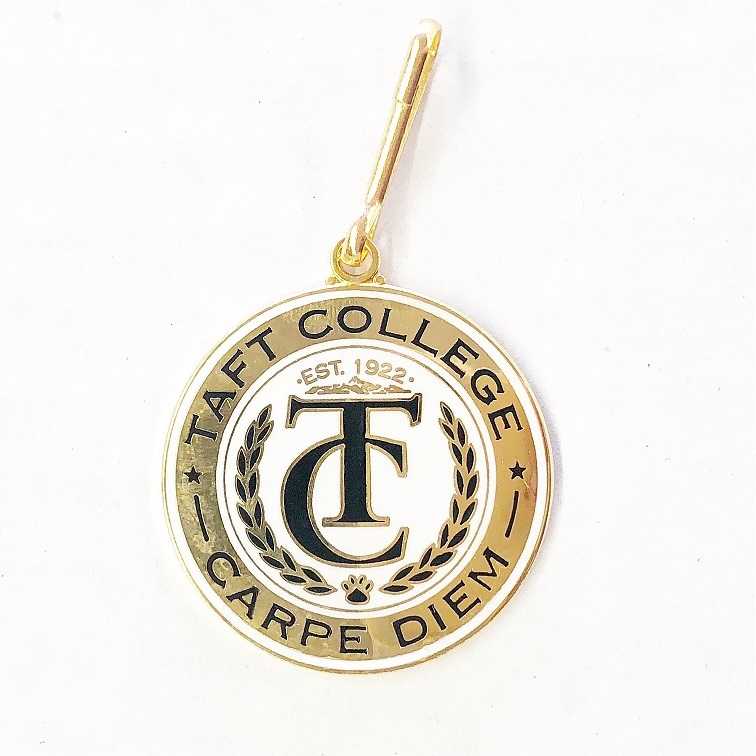 It is a great way to remember your collegiate experience at Taft College. Taft College has established a Hall of Fame to recognize individuals who have had a major impact on the college. who have excelled through competition, made a difference in the live sof our students or been strong supports of Taft College. $10.00 of your purchase supports the Taft College Hall of Fame!